Come Put Your Blindfold on For This Wine Tasting! Over the weekend, Jon and I hosted our first blind wine tasting party. I blogged about the rules in a previous post, here, if you want to know how I intended it to work. A few weeks ago I put out the invites and everybody selected a different varietal. Somewhat oddly, we ended up with a near perfect balance of 6 whites and 7 reds. My Dad was generous enough to do the honors of keeping things truly blind. Guests bagged their wines before they came in the door, and then my Dad uncorked the wines, mixed them up and labeled them with letters. So nobody knew which wine was in which bag. And even if you thought you knew the shape and color of the bottle you brought, you quickly forgot once the festivities got underway! We all were confused when we got to Wine “F”, which was a white wine. It poured red! My mom dumped it out the first time because she wanted to taste all the whites first. I kept my mouth shut and pondered to myself, because I thought my Dad had made a mistake and put a red in with the whites – but he is an engineer, and normally so meticulous! So I tasted it and knew instantly that it was a Muscat – a Black Muscat! As for me, I did really well on the whites – I guessed all 6 correctly! The reds were a different story. They were tough! I couldn’t even guess the Cabernet Sauvignon correctly – none of the wines seemed very oaky, and they were all smooth and delicious. The further along we got, the tougher it was – thank goodness we had the region bonus points! When everybody finished up with their tastings – we did the big reveal. I had everybody guess which varietal they thought it was before I opened the bag. We almost peed our pants laughing when I asked for a guess on a white wine and one of Jon’s friends called out “Merlot!” Much hooting and hollering occurred when we got a wine right! It was like being in South America when the home team scored a soccer goal! The winner for the most correct guesses received a bottle of wine, and we gave a magazine on wine for the guest who got the least correct. That was a 3 way tie for the worst score – 1 point (out of 26 possible)! So I had them duke it out via a rousing game of ‘rock, paper, scissors’ for the prize. All in all, the party was certainly fun, and definitely something that I would host again. I think everybody had fun – at least I hope everybody did! 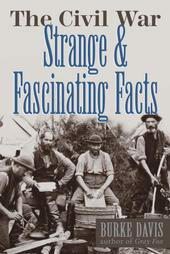 I recently read The Civil War: Strange and Fascinating Facts, by Burke Davis. It is a collection of short stories and musings on the Civil War. It is one of those books that is a hodge-podge (I love that word) of random information that the author came across while researching for another book, and couldn’t use. But of course, us history nerds don’t want random trivia to go to waste, so what better place to compile a bunch of random facts than a book about random facts!? Davis does a great job of choosing some of the more obscure trivia from the war. He details friends of men from north and south, and one horse who had four brothers shot and killed on his back. He tells stories of military inventions, and descendents of famous Civil War figures who went on to their own fame. However, some of his stories are widely known. Like the fact that the Civil War began on Wilmer McLean’s farm in Manassas, Virginia, and ended on the same man’s farm at Appomattox Courthouse (the man moved after the first battle to get away from the fighting). Or the story of the H.L. Hunley, the first submarine to sink an enemy vessel. Of course at the time that Davis wrote this book, in the 1960s, the Hunley had not yet been found on the seafloor, recovered, and placed in a museum. So I can give him a break for that one, since the story of the Hunley was probably not as widely known 40-some years ago. That leads me to a few problematic time references. Several times in his stories, Davis makes reference to Civil War descendents (usually sons, but once a widow) who are still alive. It took me aback several times thinking “but the war was 150 years ago”! Once I realized that the book was first published in the 1960s, the references made more sense. And it would be difficult to update them to modern day, since the story explores these Civil War connections in the modern day (by modern day, I mean the 60s, when the book was written). All in all, it’s an interesting book for the Civil War buff. You aren’t going to learn anything deep about a battle or a man, but it’s worth a read for the interesting trivia that he has uncovered. Enjoy. Smell This Wine – is that Cat Pee? I hosted a blind wine tasting party for some friends and family this weekend. So, to get ready for the fun, I wrote up some tasting notes for guests and it got me wondering about the adjectives that are used when describing wines. Some of the flavors and aromas, I totally get. To say something has a lot of minerality, or tastes like green apple, I can definitely see what you are talking about. But other descriptions are a bit more – let’s just say – out there. I’ve seen wine reviewers describe a red wine as tasting like leather. Huh? Now I grew up with horses, so I have actually had leather in my mouth from time to time while holding my horse’s reins between my teeth so I can free up my hands for something for a minute (not that I would recommend that as a super-smart thing to do, but don’t tell my mom). But I have never set out to taste leather, and I wonder why a wine reviewer would have tasted leather. Biting a leather strap while having his foot amputated without anesthesia? Or maybe he rode horses too, so I’ll give him the benefit of the doubt, but why would he assume all his readers have tasted leather? Once, a wine reviewer described a wine as having a hint of petrol flavor. It was in a newspaper review, but I don’t remember the winery or the wine that the reviewer was discussing. Now this is just wrong on several levels. First off, we’re in the United States – we call it gas. And then, who in their right mind would taste gas? Do you just wake up one morning craving a shot out of the pump at the corner station? I suppose maybe you have tasted gas if you are siphoning a car, but I tend to think that is generally a criminal activity, and call me biased, but I don’t think your run-of-the-mill gas thief goes for a fine bottle of Sauvignon Blanc on the weekend. Imagine being the winemaker whose wine was just described as tasting of petrol! That’s gotta hurt! Which brings me back to the wine tasting notes from this weekend. Gerwurztraminer, a German varietal that I generally associate with being a sweet wine, was described as having a taste that ranged from apricot (yes, I totally get this), to perfume and bath salts. Bath salts? Is somebody not getting enough sodium in their diet that they have to gnaw on a bath salt? Let me just say, I am pleased to not have come upon a Gerwurztraminer that I would say tasted like bath salts. Not yet anyway, I’ll keep you posted. One of the richer adjectives that I left out of my notes for my guests was that Sauvignon Blanc can smell like cat pee. I had never noticed a Sauv. Blanc smelling like cat pee before, and some of my guests were not “experienced” tasters, so I didn’t want to freak anybody out. So we are standing around the table tasting “Letter E”, and my mother in law says, “Smell this. It smells like cat pee.” And it did! Amazingly like cat pee. Of course, sadly, by this time it had been several days since I had drawn up the tasting notes, so I couldn’t remember which wine was supposed to have this aroma. Next time, I’ll include the reference for sure! I’ll be sure to blog about the blind wine tasting party soon – there were other memorable moments besides the cat pee comment. But a good time was had by all! Tomorrow afternoon I’m taking Biz up to the vet clinic for another round of tooth extractions. We know he’s definitely losing one, but they may decide to pull a second as well, because the one that has to go is one in from the edge, and when it goes, there will no longer be any stability for the outermost incisor. So, that means I’ll be doing double duty again – flushing his mouth with saline solution as the wounds in his mouth heal. For those of you who haven’t heard these stories before, Biz has EOTRH – which is the long acronym for a disease with an incredibly long name – Equine Odonoclastic Tooth Resorptive and Hypercementosis disease. In short, Biz’s teeth are getting spongy on the inside. And as they get spongy, his body creates balls of “cement” around the root of the tooth to try to prevent the tooth from just deteriorating and breaking off. This latest tooth is close to breaking and is very loose in his jaw, so it’s gotta go. Better to have a planned extraction than an emergency trip because it broke. So tomorrow, Biz will take the trip up to the vet clinic, get sedated, have a nerve block, and have that long, spongy, breaking tooth tap-tap-tapped out of his jaw. Likely in several pieces. And with much cringing by his human mother throughout the procedure. Because unlike last time, I know what to expect – and it’s worthy of some cringing. Actually, I’m pretty lucky that my horse’s vet is one of those gentle kinds of vets who has a true fascination and passion for the work that he does. He genuinely wants to teach others what is going on with the disease processes of their animals. And because he knows I’ve been to hell and back with Biz (see my other posts about Biz if you have an interest in those other traumas), he doesn’t worry at all about me breaking down in the operating room. So I get to watch! Although there is an element of squeamishness, I get to stay throughout the procedure, talk to Biz, and see firsthand how big a horse’s tooth is, all the way to the end of the root. And just how firmly rooted it is in that jaw, even if it is falling apart. So, even though I try not to worry, I will anyway. I’ll feel a lot better tomorrow afternoon when Biz is done with his surgery and he’s home… Why can’t we stop time and stay young? I guess that’s a post for another time. Jon and I decided that we wanted to do a Blind Wine Tasting Party. We have heard about them from time to time and it sounds like it would be fun. Jon and I frequently open blended wines and try to guess which grapes went into the blend, but we haven’t ever tasted wines where we have no information ahead of time about the wine. So, we came up with a plan and a strategy. For a Blind Wine Tasting Party, You Need Wine! 1. We had to limit the guest list. Unfortunately, if you leave it open ended, then you either end up with too many choices of wines, or not enough wine in each bottle for everybody to taste it. Plus the logistics of pouring small pours at stations in our kitchen, and too many people could make for a lot of bumping into each other, and the potential to spill wines or break glasses. The web (and isn’t the web always right!?) says that a tasting party gets unmanageable at more than 12 people. I invited more than that, but the laws of adult responsibilities mean that some of my friends won’t be able to attend. 2. Each guest has to bring a single varietal wine, and inform me ahead of time which varietal they are choosing to bring. Only one bottle of each varietal will be allowed. This is so we have some variety (get it, variety – varietal? 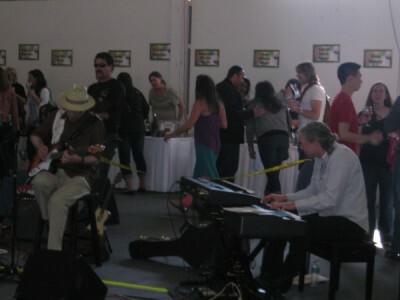 I know, that was dumb…), because it would be a different kind of tasting if everybody brought a Cab. Although that might be a different wine themed party someday! 3. 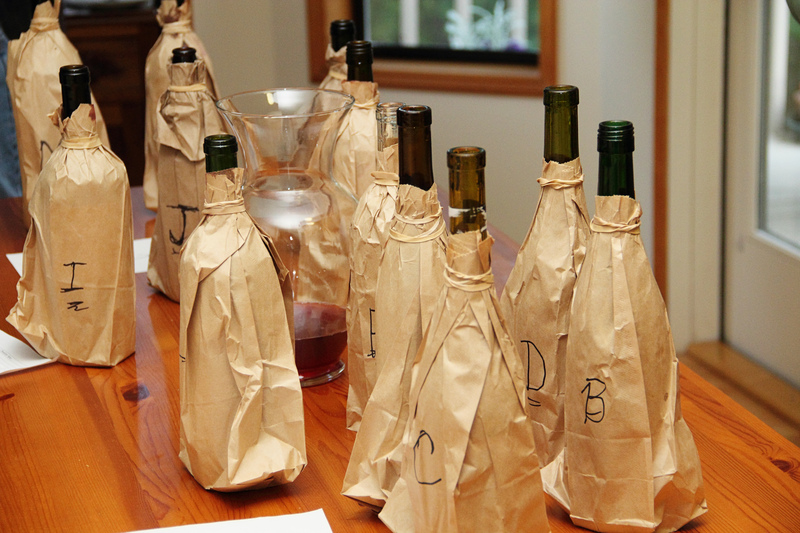 Jon and I want to play the game too, so to maintain the mystery of each wine, each guest will place their bottle in the “oh-so-classy” brown paper bag before they come in the house. This is so I can have the neighbors believing all my friends stroll about town with a shopping cart and a bottle of booze in a brown paper bag! Then the guest will uncork the bottle and remove the foil top, so nobody can read Chateau Ste. Michelle on the foil. 4. Then we’ll shuffle all the reds and all the whites, and then assign each one a letter, for anonymity. 5. 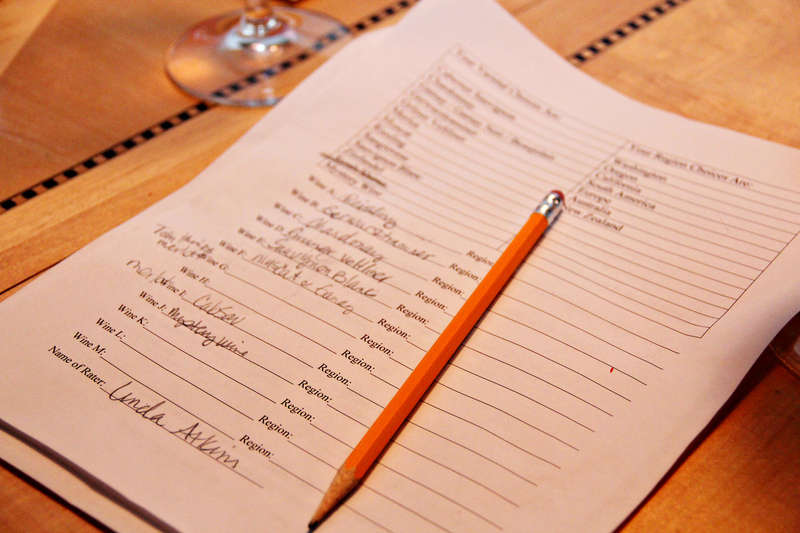 Guests can talk among themselves about the wine, but we really do want each guest to try to guess for themselves. What’s the fun in copying from your neighbor? Ok, I’m sure some of you will say that was easier in High School, but that doesn’t make it right. Plus, I have a feeling this will be ten times more difficult to judge whether a Sauvignon Blanc has those characteristics if you can’t see the bottle to know that’s what it is. I’ll give everybody a score sheet, with a section for each lettered wine. Guests will try to guess the varietal and the region for each wine. And of course, we’ll have a section for tasting notes, so guests can let us know which ones they like best, in case they want to go out and find that wine! I’m going to be nice too, and even provide a primer on the characteristics of each varietal, for my less wine-adventurous friends. It’s all in good fun, but we’ll see who gets the most points to decide the King or Queen of the glass! I’ll let you know how it goes, but let me know if you have any suggestions for how to make it better. Now I just have to wait for the party!